10/32 D-Nut Used In Cowl & Door Area. Window Garnish. These are the special clinch nuts used throughout the model A. 12/24 D-Nut Used In The Floorboards, Gas Tank And Rear Sub-Frame.. These are the special clinch nuts used throughout the model A. 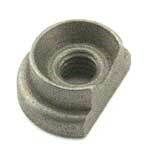 1/4-20 D-Nut Used For Rear Fender Braces & 28 Tail Light Bracket To Body. Plus Coil mounting on firewall. These are the special clinch nuts used throughout the model A. Spare tyre D-Nut 1928-31. This is the 3/8 x 24 D-nut that goes in the rear cross member that the carrier bolts to. Also used throughout the model A.